The rise of the freak-folk movement, while not without merit, has led to it being made acceptable again to whisper, mutter or croon your way through a track without it being necessary to really sing out. Your average pop-tart has a pretty weedy, flaky voice (ProTools is far more versatile than most people realise...). It's easier today than ever to make a success of yourself without being naturally gifted, and although I suppose this is more democratic in some respects, it'd be nice just once in a while to be taken aback by a natural talent. And on to Steve Adey. 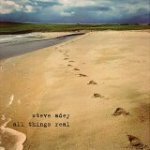 Steve Adey added me as a MySpace friend, so I instantly had reservations given the amount of dross that circulates in this wonderfully democratic, easy-entry market. And then came the taking aback. Adey has an incredibly rich, beautiful voice, and on All Things Real it's dead centre and undiluted. Tracks like Find The Way are stark yet gorgeous, with minimal instrumentation to interfere. Drums are way back in the mix, and there are just some subtle acoustic guitars, piano and the occasional string to carry the harmonies. Which is all as it should be, a voice this lovely deserves to take centre stage, as we shall see from our exhibits. Exhibit A: there are two covers on All Things Real. The first is Will Oldham's monumental I See A Darkness and the lyrical content and delivery really set the tone early on for the melancholy and anguish that pervade the record. Exhibit B: but the really impressive cover is Bob Dylan's apocalyptic break-up song from Blood On The Tracks, Shelter From The Storm. From a fairly pacey, slightly sneery original, Adey wrings a chilling, absorbing heartache of a song, where Dylan's typically obtuse lyrics take on an incredibly personal sentiment. His voice is rich and carries on long after it's comfortable, at times far louder and more in your ear than is comfortable, leaving you hanging on every word. All Things Real has its fill of pretty heartbreaking originals as well, and a number of these have a tendency to stick, not just in your mind but in your throat as well. It's a seriously impressive debut album that's sadly probably too morose, too serene to make any commercial headway. But if you pine for the day when singers had gravity and depth to their voice, when songs were proper songs, maybe for the days of Nick Drake, or at least Nick Cave when he tones down the noise, then Adey could just be your man.